For all of January, we will be going in depth on the guts of your financial plan. This week, we will be talking about spending and debt. Why do we spend in the first place? We talk through psychological triggers that cause us to spend even when we “know better” and how to manage this. We also discuss the best way to pay down debt, decide which debt to pay down first, and create a system to reduce you debt so you can start making progress and moving forward with your finances! Also, this is a special month that kicks off the 52-week financial plan in April! ONE-HOUR FINANCIAL PLAN: Short on time? Get it done fast! 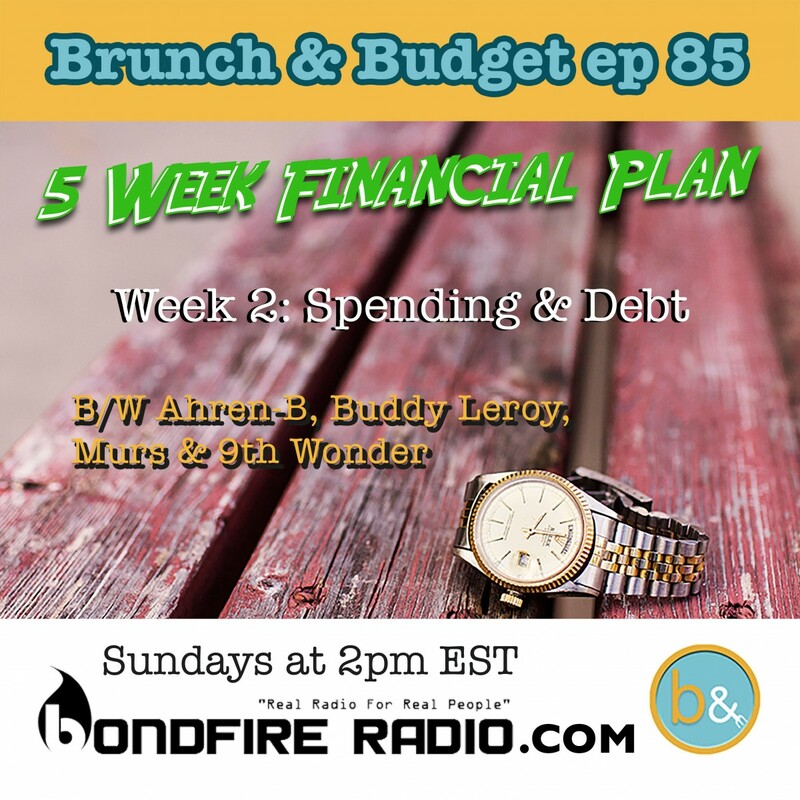 5-WEEK FINANCIAL PLAN: Every week in January on Bondfire Radio! We’ll be going in depth on each part of the plan with more strategies and action steps! Pam: The first part is really understanding and having an awareness of where the money is actually going. Dyalekt: A lot of the time people think about habit-changing the same way they think about alcoholism where it’s “This is a struggle you will delay with every day because you will never be free of it,” and that’s not the case with a lot of these habits…It will feel like that until you get yourself into that groove. Pam: A lot of people use shopping to elevate their mood. There was this data gathered by Harris Interactive that said that 31% of women say they shop specifically to elevate their mood, and 53% shop to celebrate something. Pam: Buying actually makes us feel in control, even for that moment when we’re doing it. It’s kind of that weird “I’m a grownup” moment. I can do whatever I want, I’m just gonna buy this because whatever, I have the money right now in my hand, and it can really feel especially if you’re feeling out of control in other aspects of your life that buying something makes you feel “Okay, well at least I have this.” And there’s a lot of ‘at least I have this’ going on. Pam: Especially when you buy stuff that you don’t really want in the first place. If you have clothes that you haven’t worn, if you don’t remember spending the money on this thing, then you might be doing some retail therapy. You might be shopping because you’re trying to fix an emotion or trying to compensate for an emotion or something going on in your life. Pam: Sales are such a big tactic because the thing about sales is something can be perpetually on sale but it always feels like because it’s a sale that its temporary and you have to do it now and it might run out and the price might go up next week. Pam: At the end of the day, if you are buying something you’re certainly not saving anything. Pam: Literally ask yourself why before you buy something, and it’s okay to still buy it afterwards. That’s fine, but to really build awareness as to the fact that you are purchasing something and understanding what the reason is for it. Pam: The order that you need to pay your debt down in is first credit cards, so revolving debt, so anything that has a flexible payment. Credit card debt will affect your credit score the most. ….so start with credit card debt first, and then from there I would go and pay off your personal loans…and really student loans are the last thing I would worry about. If you have federal loans, or if you have a very reasonable payment on the student loans, then take care of all your consumer debt first, and then focus on paying down your student loan. Usually student loans have lower interest rates than other debt for the most part, and its also usually a huge chunk of money for the most part. Pam: If your balance is big enough, I’d say more than a couple thousand dollars, it actually makes sense to do a balance transfer, even if you don’t think you’re going to pay it off in a certain period of time. Now the only time where it wouldn’t really make sense to do a balance transfer is if you have one of those magical credit cards where the interest rate is under 10%…Most balance transfer cards, the interest rate that you get hit with after that 0% introductory period is usually between 25-28%.